Vancouver has developed a reputation as being a leader in urban sustainable development based on the density of the downtown core, its walkability and the integration of the natural landscape into its neighbourhoods. This reputation is built on Vancouver’s history of social and environmental activism on various local and global issues such as migration, economic development and resource extraction. The environmental activist organization Greenpeace was founded in Vancouver, and currently the city is implementing a sustainability framework known as the Greenest City Action Plan. 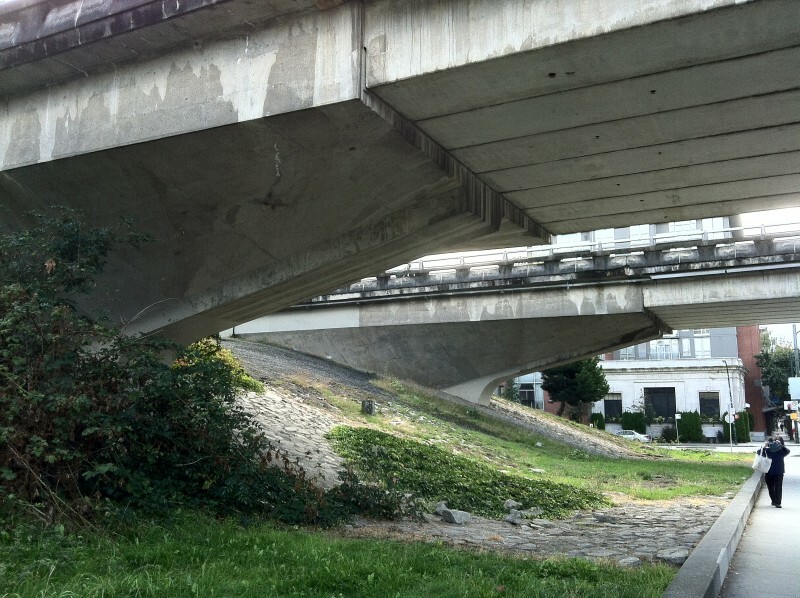 The Georgia and Dunsmuir Viaducts, which connect East Vancouver to the downtown core, are remnants of a failed plan to bring a freeway through the heart of Vancouver in the 1970s. The viaducts are what architect Aldo Rossi calls urban artifacts – public, material structures that have layers of meaning placed on them by people in the city. Public opposition to the freeway plan is often credited with preserving the city’s historical neighbourhoods such as Gastown, Chinatown and Strathcona. It was a defining moment when urbanist and activist Jane Jacobs’ ideas of mixed-use urban spaces populated by socially and culturally diverse communities triumphed over urban planner Robert Moses’s modernist utopia of highways and highrises. Today, the city is exploring options for removing the viaducts completely under the Greenest City Action Plan. So how is it that a 50-year-old battle about highways in the city helped to make Vancouver environmentally conscious? How does the city implement sustainability policies? In the 1950s many cities in North America were undergoing urban decay, which was defined by stagnating economies due to deindustrialization, depopulation, changing and racialized populations moving into the urban centres, a wave of immigration to North America, a growing ideology of home ownership and suburbanization, fears of increased crime, and poverty leading to increased instances of ill health, illicit drug use and decreased property values. This narrative of urban decay was often the impetus behind implementing large-scale urban restructuring projects such as highway construction, public housing projects, and modern highrise office buildings. As a result of these large-scale projects, many historic neighbourhoods were destroyed and poor and marginalized communities were displaced. The phenomenon of depopulation and stagnant economies was not as severe in most Canadian cities as in the United States, but Canadian urban planners, politicians and those with economic interests still worried about what might happen to their cities. Vancouver, with a pro-development government at the time, advocated for a large rescaling project based on people driving cars. In 1960, the Vancouver Board of Trade put forward a development plan advocating a 45-mile network of freeways linking the metropolitan region. The Georgia and Dunsmuir Viaducts, built in 1972, are the only completed part of this plan. Around the same time, Project 200, a Vancouver waterfront redevelopment, was introduced. It included a freeway running along English Bay and through Gastown, Chinatown and Strathcona. The plan was to build modern highrise towers and a freeway exit leading commuters straight to parking garages on the waterfront. Luckily, Project 200 also did not come to fruition. In 1971, the federal government stated that money slated for urban redevelopment in British Columbia could not be used for transportation development. The reasons for that decision were not due to a lack of money, or austerity measures but because of the sustained efforts of Strathcona residents organizing against urban renewal projects and the transportation projects that ensued from them. Why didn’t these freeway plans materialize as they did in so many other North American cities? The two dominant narratives about why Vancouver did not build the freeway are (1) there was not enough regional planning coordination and resources for a freeway to be built in the metro Vancouver region, and (2) people, through community activism and professional groups, rejected the plan. By 1967, the Chinatown Freeway Debates, as they are commonly known, become weekly events, with 500 to 800 citizens crowding city council meetings protesting the destruction of Strathcona. On November 8, 1967, the federal minister responsible for housing, Paul Hellyer, toured Strathcona with local activist Shirley Chan and city planner Darlene Marzari, two of the main people heading community opposition, along with a lawyer, Mike Harcourt, who later became mayor of Vancouver and then premier of the province. This tour had such an impact on Hellyer that he froze federal funding for urban renewal projects across Canada, including funding that Vancouver city hall was counting on to finance freeway construction. The Chinatown Freeway Debates were a turning point in Vancouver’s planning processes. From this point on, community consultation became a benchmark for urban planning in Canada. The 1972 municipal elections ensured that this process was jumpstarted. The Non-Partisan Association (NPA), the municipal political party that had been in power for 30 years, was defeated in both mayoral and council races by the newly formed Electors’ Action Movement (TEAM). Two of the councillors elected were Mike Harcourt and Darlene Marzari, who had earlier helped to organize Strathcona residents. Forty years after the planning debate, in 2013, Vancouver City Council approved a $2.4 million final planning phase of the Georgia and Dunsmir Viaduct removal. The viaduct removal will open seven acres of land, which is owned partly by the city and partly by a private developer, Concorde Pacific. It will also allow the city to address traffic calming issues that are a direct result of the viaducts having been built in the first place. There is general consensus that the removal of the viaducts is environmentally beneficial for Vancouver, but there remain questions about how the development will proceed, who might be displaced, whether this development will be socially just and which business interests will benefit. It is estimated that about 1,000 housing units could be developed on the land, and 20% or less could be designated as affordable housing (City of Vancouver, 2011), which would help the city address another planning priority, homelessness. The redevelopment is also intended to make way for a “greenway” into the downtown, rerouting the traffic that currently travels along a busy entrance to the downtown core. The concern is that this rerouting will endanger one of Vancouver’s oldest community gardens and the produce warehouses that operate along Malkin Avenue. Questions about the nature of urban planning, public consultation and social sustainability have come to the forefront of the debates around the viaduct removal. Neighbourhood residents are asking how the city-favoured plan maintains communities, and what the nature of public consultation is. Strathcona’s legacy of community activism and multiculturalism is a part of its identity. But, as the current debate about the viaduct removal shows, the struggle continues. Case Study 1: The Georgia and Dunsmuir Viaducts by Geography Open Textbook Collective is licensed under a Creative Commons Attribution 4.0 International License, except where otherwise noted.